Renowned ensemble Boston Brass will present a concert on Thursday, Oct. 31, at 5 p.m. in the Rose and Jules R. Setnor Auditorium, Crouse College. The performance is free and open to the public. The concert is presented as part of the Baker Artist Series in the Rose, Jules R. and Stanford S. Setnor School of Music in the College of Visual and Performing Arts. Boston Brass will be in residence in the Setnor School Oct. 31-Nov. 2. The ensemble will also perform with the SU Marching Band during the Nov. 2 SU football game versus Wake Forest in the Carrier Dome. Free and accessible parking for the Oct. 31 concert is available in the Q1 lot. Additional parking is available in the Irving Garage. Campus parking availability is subject to change; call the Setnor School at 315-443-2191 for current information. For 26 years, Boston Brass has set out to establish a one-of-a-kind musical experience. From exciting classical arrangements to burning jazz standards and the best of the original brass quintet repertoire, Boston Brass treats audiences to a unique brand of entertainment, which captivates all ages. The ensemble’s lively repartee, touched with humor and personality, attempts to bridge the ocean of classical formality to delight audiences in an evening of great music and boisterous fun. 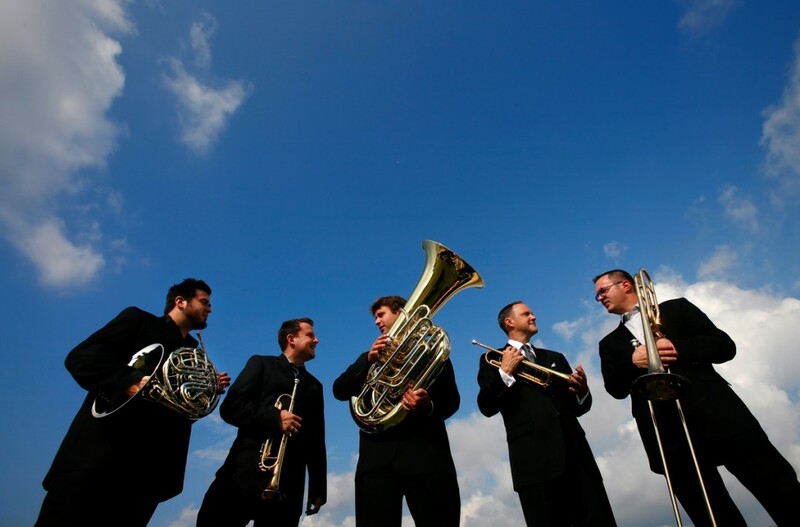 The philosophy of Boston Brass is to provide audiences with a wide selection of musical styles in unique arrangements, provided in a friendly and fun atmosphere. Through more than 100 performances each year, the members of Boston Brass play to audiences at concerts, educational venues and jazz festivals. In addition to solo performances, Boston Brass regularly performs with orchestras, bands, organ, jazz bands and a variety of other ensembles. They have performed in 49 states and 30 countries and have conducted master classes around the world, including sessions and residencies at the Eastman School of Music, the Julliard School, Shepherd School of Music at Rice University, Peabody Conservatory of Music, University of North Texas, Royal Academy of Music in London, Yong Siew Toh Conservatory in Singapore and Mahidol University in Bangkok. Learn more at http://www.bostonbrass.com. Founded in 2013 with a grant from the Dexter F. & Dorothy H. Baker Foundation, the Baker Artists Program allows the Setnor School to offer a more robust on-campus residency program and provides support for music majors to take master classes and attend workshops and performances in major music cities. Learn more at http://vpa.syr.edu.